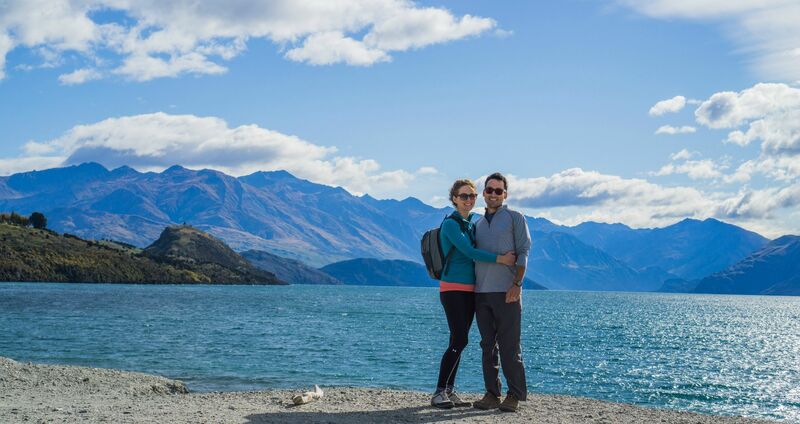 We spent a total of three weeks in New Zealand which was the perfect amount of time. This gave us plenty of time to readjust from jet lag in Auckland prior to renting a small car to drive down and fly out of Queenstown. 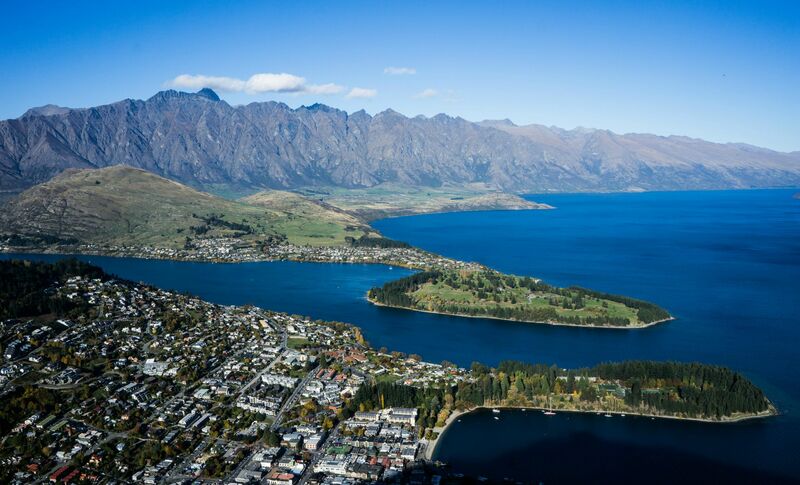 At first, New Zealand seemed to be one of the most daunting places to budget for due to the high daily cost of lodging, activities, gas and food. However, with a good exchange rate with the US dollar and many amazing, budget-friendly lodging options with Airbnb, we were very comfortable and well under our budget at the end of our three weeks. I cannot speak highly enough for Airbnb. Since we were traveling as a couple, it actually made it cheaper than staying at hostels which was very surprising and so much nicer! We chose private rooms or entire apartments based on cost and availability. Often times, the extra bonus of having access to free coffee/tea, a kitchen, laundry and the occasional perks like free bikes/etc really helped us keep under our budget. We hiked (“tramped”) most days and packed lunches to eat while on the trail (“track”). Our daypacks came in handy for this as we generally did hikes ranging from 2-6 hours. 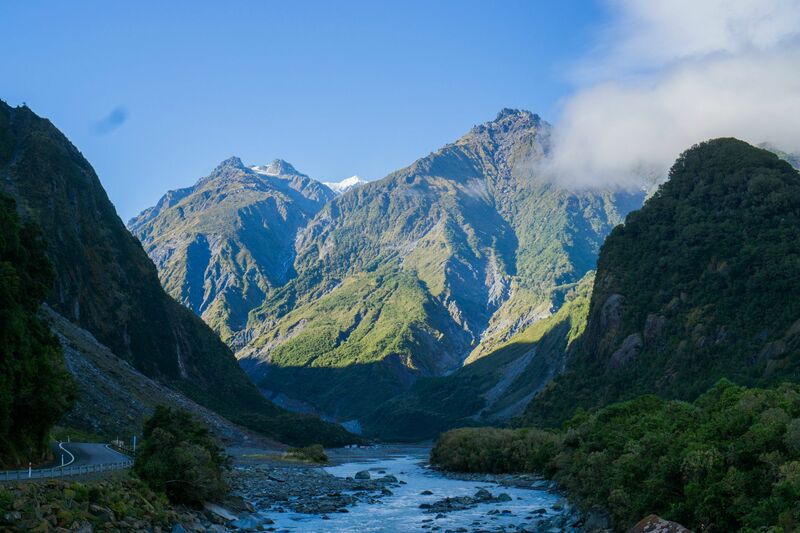 Our favorite hikes included Abel Tasman National Park, Fox Glacier, Franz Josef Glacier and Queenstown Hill. The autumn weather in April was perfect for hiking, a great time to be in New Zealand and so beautiful with the changing leaves further south in Queenstown. Hiking in the Fox Glacier was amazing during fall. Besides driving on the left side of the road, other tidbits unique to Kiwi culture included: great coffee, “fluffy” coffee drinks for kids, delicious lamb and venison, barefoot people everywhere, the surprisingly tropical feel to the North Island with the abundance of ferns and lush rainforest. Our three-week itinerary was divided into one week for the North Island and 2 weeks for the South Island. Flying into Auckland was the easiest and we found great budget flights on Virgin Australia to fly from Queenstown to Brisbane, Australia. Auckland is a great city! We were lucky to stay with extended family there for 3 nights in Flat Bush (thanks Alice, Robbie & Jackson)!! Highlights included: lamb on the barbie, the harbor, Sky Needle and learning about the Kiwi culture from our lovely hosts! 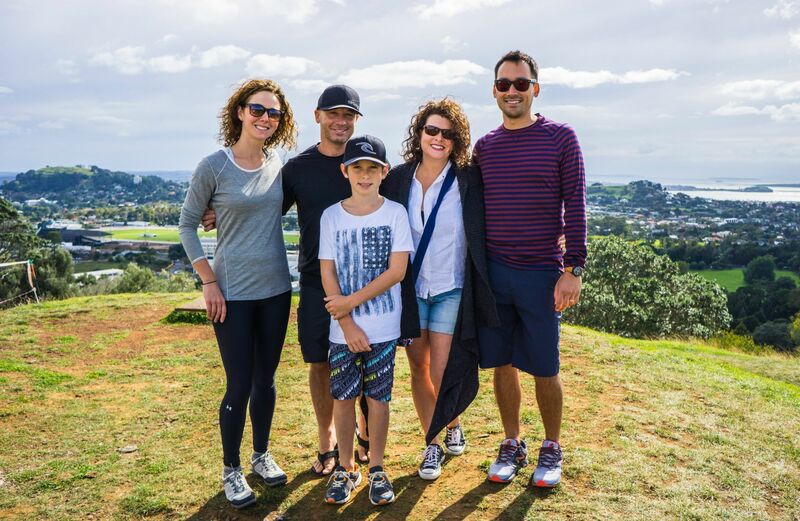 We had a great time with Robbie, Alice, and Jackson in Auckland. We stopped in Waitomo to see the glowworms on the drive down to Napier. The caves were stunning and it was surreal to ride in a boat in the total darkness while looking above to see a “starry sky” of green, luminescent glowworms above. Great Maori tour guides. Overall, neat to see but a bit touristy/pricey so not an absolute must see unless you have a bit more time to see the North Island. In Napier, the Art Deco buildings which encompassed the entire downtown were impressive. Napier suffered a devastating earthquake in 1931 which resulted in the area’s reconstruction in the Art Deco style. After living in South Florida, it was interesting to see how well maintained and beautiful the architecture was in Napier compared with Miami, Florida. In Napier, the Marine Parade walk and the downtown area was charming. Of note, Church Road had a wonderful guided tour of the winery with an in-depth viewing of the entire process which we would likely have not had access to at a similar winery in the United States. It was $15 and included an extensive tasting of many of their reserve wines. Please view the New Zealand video on this website too to see more! Most wine tastings in New Zealand are free unless they are able to provide a restaurant or food available, then they are able to charge for the tasting (usually around $5 or more). Of note, if you buy a bottle of wine, they will waive the tasting fee. This city exceeded our expectations and we left wanting to stay for longer! We really adored Wellington and would highly recommend adding this city to your trip! You could feel the pulse of Wellington with its hip vibe similar to San Francisco on a smaller scale. Te Papa Museum, the harbor, and people-watching all the hipster college kids on Cuba Street from the cafes were our favorites! Garage Project Brewery had a great tasting room and some very interesting brews- most notably La Calavera Catrina Habanero Blonde Lager- it definitely delivers the heat but with a pleasantly smooth finish! We stayed in Kelbun at a cute Airbnb in on the hill. Taking the 3 hour ferry through the Marlborough Sounds was one of the more memorable parts of our trip, astonishing beauty! A must see! Hiking Mount Victoria in the morning provides breathtaking views over the city. Blenheim was absolutely stunning. Beautiful vineyards with incredible mountain backdrops. Sheep roamed around the wineries and many offered free tastings and had restaurants available for lunch. Blenheim's vineyards are truly astounding, and there are sheep! Renting bikes for the day in the Marlborough wine country region of Blenheim to stop at different wineries was fantastic! We used Wine Tours by Bike which was incredible, affordable and would highly recommend this place. They also picked us up in their van from our Airbnb lodging. We really enjoyed Giesen (amazing whites and interesting oak barrel aged sauvignon blanc!) and Hans Herzog wineries (great unique varietals for New Zealand). We fell in love with Waitapu River Winery’s lunch menu (best lamb kofta salad and green mussel chowder we’ve ever tasted)! Truly memorable flavors and would highly recommend! Thanks to Wine Tours by Bike for their reccs! Nelson was a great area for hiking given its close proximity to Abel Tasman and its beautiful location along the coast. 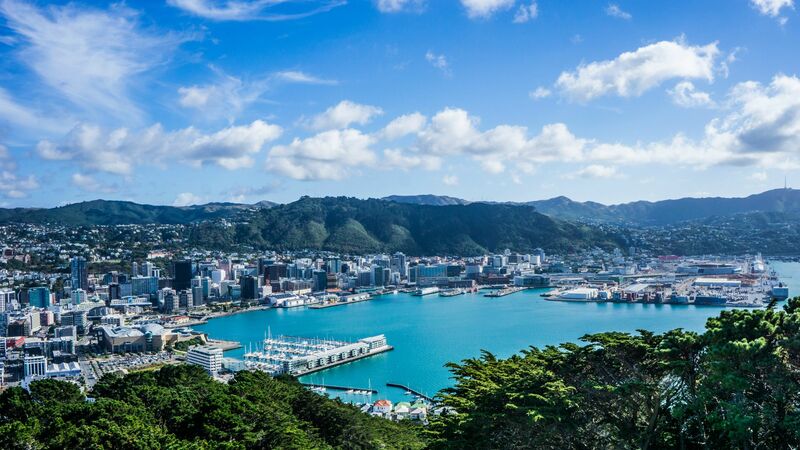 There is a nice hike to the “Center of New Zealand” that we recommend which starts from the city center. We took a day trip from Nelson to the park- a MUST SEE. Such a great hike! We took a boat which dropped us off on the trail and we hiked for 4 hours to another boat which picked us up and brought us back. We did the condensed version, I’m sure it would be incredible to bring camping gear to do the entire 3 day hike, wish we could have! Driving down the West Coast was insanely rugged and beautiful. The Pancake Rocks were much more incredible than I imagined. From the online posts I had read before the trip, I initially thought it was just a couple of rocks to snap a photo of. To the contrary, it was a nice 30-minute or more walk through a well-groomed park with multiple lookouts. Great place and a nice place to stop on the drive down the West Coast. A brief stop here to stay overnight here on the drive down the West Coast. Our Airbnb was so close to the coast you could smell the salt air! Great hosts and a nice small town feel! A place to recharge and walk along the beach. Truly incredible to be able to hike through the glacier cut mountains up to 2 glaciers! Some of our best and most memorable hikes too! It was surreal to walk through the lush rainforest, across suspension bridges, up to the foot of the glacier and feel the cool air emanating from its vastness. We didn’t have the budget for heli-hiking though which seemed to be popular with the Chinese and Japanese tourists. The towns are teeny tiny. We stayed in Fox Glacier and loved our meals at “The Last Kitchen” – incredible venison and lamb. We highly recommend this restaurant- so delicious! Wanaka seems to be what Queenstown was 20 years ago- fewer chain stores and less crowded but just as beautiful. It’s lake is surrounded by the mountains with great little downtown strip, and with a small enough feel to allow campervans to stay overnight directly in front of the lake in the downtown area. The lake path is beautiful, the leaves were changing to beautiful hues of yellow along the lake. The best view here was at Rippon Winery which you can bike or walk up to from the path. See the video and album for more incredible pics! We really enjoyed our time in Wanaka. Lake Wanaka was one of the most beautiful places we visited in New Zealand. Great adventure town! Sky is the limit in terms of picking your adventure sport. We did some great hikes and also hiked up to the gondola. We were glad we stayed at the Nugget Point hotel in Arthur’s Point which is a beautiful 10 minute drive to Queenstown through the mountains and river valleys. It felt like we had our own private part to escape the busy tourist areas. Queenstown Hill was one of our favorite tracks in New Zealand. Majestic beauty and surreal. Probably one of the most memorable things we did in New Zealand and it was high on our bucket list. We had a difficult time deciding whether to choose a clear or rainy day, but after hearing multiple different recommendations, we went with rainy and we are so happy we did. I think we saw literally a thousand waterfalls (not kidding)! We had some great rain and thus amazing falls both during the boat cruise and on the drive to the sound. We got up early and did the drive ourselves which was really nice and we could choose our pace instead of going with a tour bus. Make sure to fill up on gas in Te Anau as there are no stations within 2 hours of the Sound. We chose Real Journeys tour boat which was awesome, we had a very small, intimate group which made it even more enjoyable. Also, fun factoid: the “Sound” is actually a “Fjord” as it is glacier cut, not river cut. Watch our New Zealand video to see all the waterfalls!